Mimetic, or mimic, architecture is a programmatic approach to building design — the building is shaped to mimic, or copy, the function, usually a business function, or to suggest objects associated with their function. It's EXTREME "form follows function." It's more like "form IS function." When America first saw this architecture in the 1920s, it was spectacle, like a Hollywood movie. The 1926 Brown Derby restaurant was shaped like a brown derby. This type of architecture was funny and playful and kind of tacky — but not in the sticky sense of the word. But that was back then. Today, a young Irish architect named Dominic Stevens has created what he calls Mimetic House, architecture that mimics the landscape surrounding it. This is NOT what mimetic architecture used to look like. Mimetic architecture is more like McDonald's making itself into a Happy Meal. The familiar red container heaping with fries becomes part of the facade at this fast food franchise. This playful architecture is often found in tourist spots, like near the theme parks of Orlando, Florida. The mid-twentieth century was the heyday of mimetic architecture. Commercial buildings were designed to catch the attention of potential customers. A coffee shop might be shaped like a coffee cup. A diner might be painted and stuccoed to resemble a hot dog. Even the most inattentive passerby would know instantly what was featured on the menu. One of the most famous examples of mimetic architecture is the Longaberger Company corporate headquarters in Ohio, more commonly known as the Basket Building. The company manufactures baskets, so the architecture of the building becomes a way to promote their product. Perhaps the East Coast was too staid and proper to build mimetically. The Cheese House in Arlington, Vermont wasn't built until 1968. The Midwest was much too sensible to embrace mimetic designs early on, yet today Ohio is home to the most iconic piece of mimetic architecture — the Basket Building. Much of the playful, roadside architecture known as mimetic was developed on the West Coast as far back as the 1920s. RoadsideAmerica.com rates Bob's Java Jive with 3 "Smiley Face Water Towers," meaning it's worth a detour to see it. So if you're anywhere near Tacoma, Washington, check out Bob's 1927 Java Jive. America's West Coast is filled with interesting people, places, and things. With its heyday in the 1950s, mimetic architecture is just one type of roadside or novelty architecture. Other types include Googie and Tiki (also known as Doo Wop and Polynesian Pop). Where Does the Word MIMETIC Come From? In architecture, the form of the mimetic building imitates the functions that go on inside the building. The adjective "mimetic" (pronounced mi-MET-ic) comes from the Greek word mimetikos, meaning "to imitate." Think of the words "mime" and "mimic," and you'll be confused about the pronunciation, but not the spelling! The new mimetic architecture is organic, like Frank Lloyd Wright's Prairie Style on steroids. It is built into the earth and becomes part of the landscape with reflective glass. 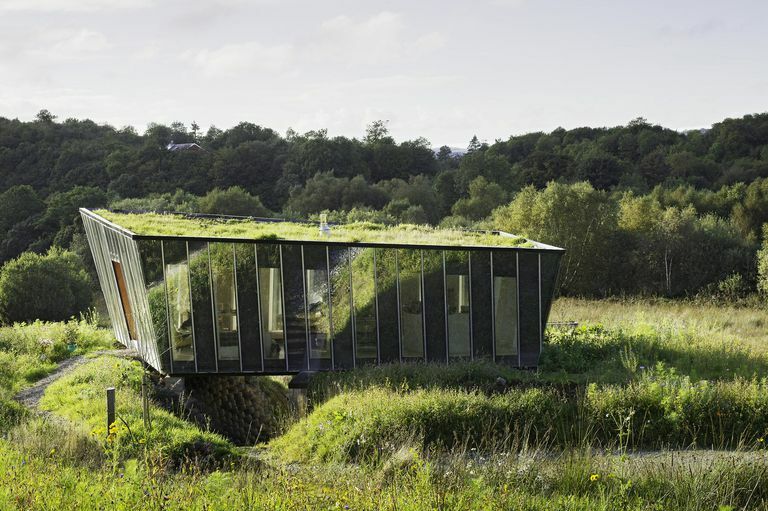 Its green roof is another plateau in the Irish countryside. Between 2002 and 2007, Dominic Stevens and Brian Ward designed and built this 120 square meter (1292 square feet) custom home in Dromaheir, County Leitrim, Ireland. It cost about €120,000. They named it Mimetic House, no doubt, for its ability to mimic its environment. "The house doesn’t alter the landscape in which it sits," they say, "rather, the constantly changing landscape alters the house." So, is it or isn't it? Is the Mimetic House mimetic architecture? The historic mimetic architecture — the buildings shaped like hats and cheese wedges, donuts and hot dogs — use mimicry to advertise and call attention to themselves. The Irish architects here use mimicry to conceal human habitation, to hide the house like a rabbit's nest in an open field. We can't deny that this is mimicry, but we're not laughing anymore.